This article was co-authored by Viral Shah. The first two months of this year, for Delhiites, were marked by filth and household waste lying around their houses and on streets for many days during strikes by the municipal corporations’ safai karamcharis or sanitation workers. Our excessive reliance on “others” to manage “our” waste let the situation go out of hand. This could have been averted if communities had been managing their own waste in a decentralised manner. Thus, we as citizens must stop the Not in My Backyard (NIMBY) approach to the waste that we generate. According to Delhi government’s Department of Environment, Delhi generates 8,360 tonnes of municipal solid waste on a daily basis. This is managed by five local governments—East Delhi Municipal Corporation, South Delhi Municipal Corporation, North Delhi Municipal Corporation, Cantonment Board and New Delhi Municipal Council—which dump waste at three landfill sites in Bhalswa, Okhla and Ghazipur. One might have even seen these huge mountains of garbage while travelling out of Delhi. These landfills have run out of their capacity since long but continue to be operational due to unavailability of land for new landfills. Processing and treatment of waste is an essential service that must be provided by the local authorities. But in reality, at most places the waste is just collected only to be deposited at another place with minimal or no treatment. It is estimated that the per capita generation of municipal solid waste in Delhi is 500 grams per day and over 50 per cent of this waste is bio-degradable or recyclable. However, the type of waste largely varies across the city according to people’s lifestyle and income level. Thus, for efficient solid waste management (SWM), the composition of waste must be determined at the level of treatment. The principal problem of waste management is that there’s not enough money for it as it’s not considered a priority. Hence, to deal with waste, we need to bring down the costs, use new innovative technologies, or raise revenues from user fees, taxes, selling of recycled items and so on. Ideally, we need to do it all. A majority of the cost component includes collection and transportation. And this can be brought down by decentralised SWM and efficient implementation of modern logistical solutions. Solid waste management has been believed to be the responsibility of solely the municipal governments. However, decentralised SWM involves a paradigm shift from this perception and system of SWM, and puts the onus on the generator of the waste by beginning waste management at the source. This would reduce the quantity of waste generated at source by involving the community in waste segregation and processing by adopting practices of recycling, composting, bio-gas generation, among others. The Solid Waste Management Rules, 2016, released by the Union Ministry of Environment, Forest and Climate Change are a step in this direction. This will reduce the cost incurred in collection, transportation and processing of waste. Also, less waste will reach the landfill because in most cities as much as 50 per cent of the waste is fit for composting and about 30 per cent for recycling. Effective segregation at source, in transit and during disposal, will mean only 20 per cent of the refuse is needed to be sent to the landfill. Importantly, informal workers like rag-pickers and recyclers would get integrated into the system. Pune Municipal Corporation’s initiative to integrate the rag-pickers in SWM process through an organisation named SWaCH has proved to be a success in effective SWM. Similarly, the work done by SEWA in Ahmedabad to integrate female rag-pickers in the mainstream has shown great results and has been appreciated by the World Bank. How to achieve decentralised SWM? The focus of a decentralised SWM initiative should be on the segregation of waste at source by institutionalising this throughout the waste management chain from collection to disposal and by promoting behavioural change. The NIMBY approach must be completely wiped out by incentivising segregation at source, systematic awareness programmes, involving the youth and making waste management a matter of pride rather than just another task. There is tremendous potential in group housing societies to reduce the burden on civic agencies by segregating waste at household level. The organic waste, which is in majority, can be composted at site or if feasible, there can be a common composting site for a few housing societies. The manure produced can either be used for gardens in the housing societies or for public parks. Manure can even be sold to earn some revenue for sustaining the system. Involving rag-pickers and recyclers of the neighbourhood in processing waste would help both the society and rag-pickers. The rag-pickers can collect and sell the recyclables. This too reduces the waste headed to the landfill and prevents rag-pickers from having to rummage through the waste. It’s encouraging to know that there are communities that have undertaken such initiatives. In Delhi, Resident Welfare Associations (RWAs) have been key players in decentralised SWM. A Defence Colony RWA has been composting the colony’s household and park waste in simple dug pits in a park for many years now. The municipal corporation supported construction of the pits and the operational costs are met through user fees, sale of recyclables and manure (a detailed case study can be found here). 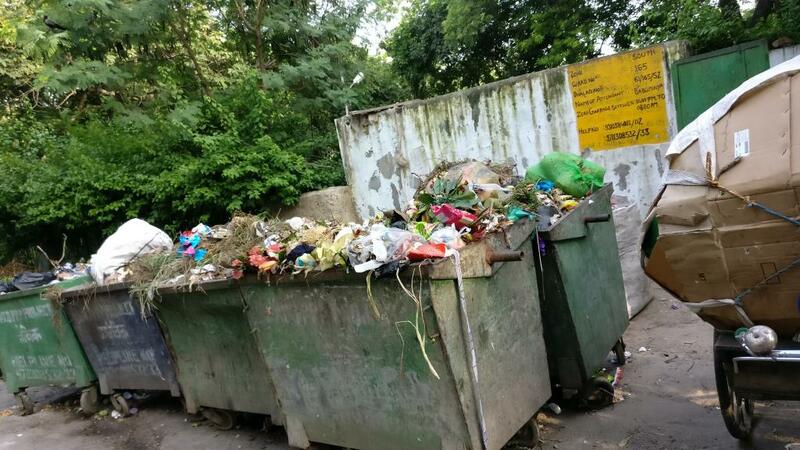 A Vasant Vihar RWA had also started composting in a park, but a visit in August showed that the composting has been stopped due to some residents’ concerns over foul smell. Thus, the entire community must be mobilised from the planning stage itself and each household must have a stake through source segregation. Only when every citizen takes ownership of waste management will we actually achieve a Swachh Bharat. Apula Singh is a research associate at Vision India Foundation. She has a Masters in Urban Policy and Governance from TISS Mumbai. Viral Shah is an Ahmedabad-based civil engineer who works on innovative solid waste management practices. I think all cities of India need to seriously plan to switch to Decentralised SWM as the day is not far when we all will be consumed by the growing dumping grounds. MOEF has just passed the MSW Rules 2016 but there seem to be no efforts from any state government towards implementing them. I fear they will go the same way as the 2000 version. It appears that solid waste management is nobody's baby! political class, bureaucracy and citizens just don't consider it a problem. NGOs like CSE should take on the work of awareness creation and increase people's participation. I am sure all concerned citizens will support such a movement. They will ask the people's representatives at various elections for action. Good article. Particularly liked where it was mentioned that waste management should be a matter of pride and not just another task. This shift in people's perception has to be brought and when that is done the battle will be won.